Fórsa said today that newly agreed measures on public service new entrants’ pay successfully addresses the task of that unions undertook in 2013 to resolve the issue. Speaking today after a plenary meeting between ICTU’s Public Services Committee (PSC) negotiating group and representatives of the Department of Public Expenditure and Reform, Fórsa communications officer Niall Shanahan said the new measures will mean that public servants will no longer be at a long-term disadvantage based on the year in which they were recruited. The remaining issue to be resolved since 2013 was that post-2010 recruits had two additional points on their pay scales, which means it took them two years longer to reach the top of their scale. “When we negotiated the Haddington Road Agreement in 2013, we successfully merged the pre-2010 and post-2010 pay scales. The remaining issue to be resolved was that post-2010 recruits had two additional points on their pay scales, which means it took them two years longer to reach the top of their scale. “Under the terms agreed in the Public Service Stability Agreement (PSSA) last year, we achieved a commitment to resolve the remaining issue, which has now been brought to a conclusion two years earlier than originally anticipated. This completes the task we began by merging the pay scales in 2013,” he said. The newly agreed measures identify two points on each pay scale – year four and year eight – which new entrant public servants will now skip. For example, a public service worker recruited in 2016 (currently on point 3) will move to point 5, rather than point 4, of the scale in 2019. 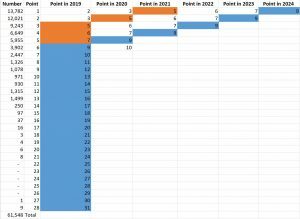 Similarly, a public service worker recruited in 2013 (currently on point 6) will move to point 9 of the scale in 2019, meaning that public servants with more than four years of service are not at any disadvantage.